The SNAP-PAC-S1 programmable automation controller provides powerful, real-time control and communications to meet your industrial control, monitoring and data acquisition needs. One of the four components of the SNAP PAC System, the SNAP-PAC-S1 is fully integrated with PAC Project software, SNAP PAC brains, and SNAP I/O modules to form a complete control system. The SNAP PAC System includes digital and analog control, serial string handling, PID loops and enterprise connectivity. The SNAP-PAC-S1 controller is compact and industrially hardened. It includes two independent Ethernet network interfaces with separate IP addresses, which can be used to segment the control network from the company network or for redundant Ethernet links. You can also set up a system with redundant controllers using two identical S-series controllers, the SNAP PAC Redundancy Option Kit, and PAC Project Professional 9.0 or newer. The SNAP-PAC-S1 also has three serial ports: an RS-232 port with full hardware handshaking, ideal for PPP communication using a modem; another RS-232 port for connecting directly to serial devices; and an RS-485 port for connecting to SNAP PAC Serial brains or to legacy mistic I/O units. 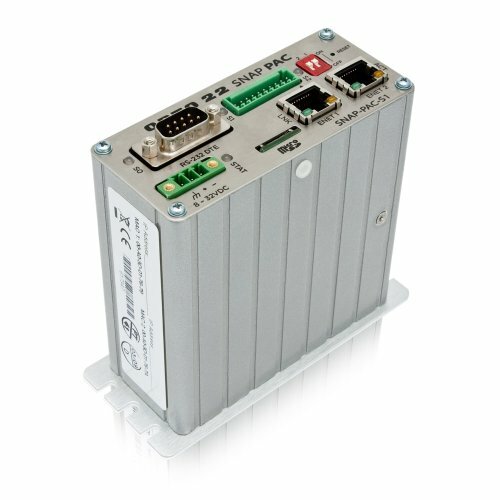 Connecting to Opto 22 serial- and Ethernet-based I/O systems, a SNAP PAC S-series controller runs control programs written in Opto 22’s PAC Control software to monitor and control a wide range of devices and equipment. SNAP PAC S-series controllers are well suited to original equipment manufacturers (OEMs), system integrators and end-users in process control, discrete manufacturing or hybrid industries and applications. A SNAP PAC S-series controller simultaneously runs up to 32 PAC Control flowcharts, although the PAC Control strategy can contain a much larger number of charts.